Conference on Peace in South Asia: Opportunities and Challenges, 15 – 16 November 2017, Address of Welcome, Dr. Masuma Hasan, Chairperson, The Pakistan Institute of International Affairs. Mr. Mamnoon Hussain, President Islamic Republic of Pakistan, Mr. Muhammad Zubair, Governor of Sindh, Ladies and gentlemen. It is indeed a great honour and privilege for me to welcome you to this session which His Excellency Mr. Mamnoon Hussain has graced with his presence. I am extremely grateful to him for being with us today inspite of other pressing engagements. He is the symbol of the federation of Pakistan and those who are aware of the politics of our country are also aware of the positive role he has played to consolidate democracy in our country. With his wisdom he has shown a deep understanding of international politics and has represented Pakistan at many important diplomatic initiatives abroad. The Institute has organized this Conference on Peace in South Asia to mark 70 years of its founding. We have chosen the theme of peace not only because of its contemporary relevance but also because of its historic link to the sentiments expressed by Prime Minister Liaquat Ali Khan when he inaugurated the Institute. In his speech on that occasion he said “That so soon after the establishment of Pakistan, a Pakistan Institute of International Affairs has come into existence is a matter of gratification.” Calling for world peace, he continued, that international affairs effect not only governments; they also effect the people. What happens in one part of the world has its reactions in other parts. If peace is disturbed in one continent it has its effects in another. Thus in this age of global war, global politics and global economics, international affairs concern not only the state but also the common man. It follows that the common man should try to understand them. To provide facilities for such study this Institute has been brought into existence.” He expressed his confidence that it would lead to the creation of informed public opinion. He said, further, “International peace is a vital necessity today. Mankind cannot be allowed to go through the moral degradation, the unspeakable horrors and the resultant devastation of a third world war … Peace is also necessary for the healthy and steady growth of the infant state of Pakistan, for its proper development, indeed for its very preservation.” As we all know, today the pursuit of peace is enshrined in Article 40 of the Constitution of Pakistan. The attainment of peace has eluded mankind throughout known history. In earlier times and indeed until a century ago, war was considered legal. It was the only way through which states enforced their rights and settled disputes, obtained reparations and captured territory as compensation due to perceived wrongs. It was legitimized violence. The horrors of the two world wars in the 20th century shook the world and a system emerged at the international level, making war illegal. The United Nations Charter lays down that the only exception to the use of force is when it is approved by the Security Council and when a state has a legitimate claim to self-defence. But there have been many unilateral uses of force by powerful countries as we have seen in Iraq and Afghanistan. South Asia is no exception to war and conflict. It is home to some of the most intractable disputes, including that of Kashmir. The countries of the region are also victims of violence by non-state actors in which thousands of people have perished. South Asia is home to a population of 1.8 billion people, some of the poorest in the world. If the conflicts within the region are settled, the resources spent on defence can be diverted to raising the standard of living of its poverty stricken people. The Conference addresses all these issues, including security concerns and inter-state disputes, and also explores avenues for cooperation. A word about the Institute itself. It is an independent, non political and non-profit organization established in 1947 to pursue study and research in international relations, economics and jurisprudence. At that time Karachi was the capital of Pakistan and we were able to help our fledging foreign office with expertise and professional resources and this has always been recognized. The purpose of the Institute was to act as a bridge between public policy and public opinion. 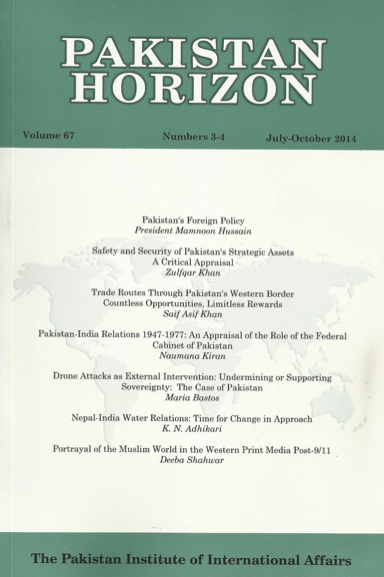 Our research is reflected in our publications, especially in our flagship quarterly, Pakistan Horizon, which has appeared without a break for 70 years. It is the oldest journal of academic excellence in Pakistan. The roots of our Institute go back in time to 1936 when The Indian Institute of International Affairs was established in Delhi. As Pakistan became a reality, the members of that Institute, by a majority vote, decided to shift it to Karachi. This move had the blessing of Quaid-i-Azam Mohammad Ali Jinnah and Mr. Liaquat Ali Khan. Perhaps it was the only organization which moved to Pakistan through a vote. Our first offices were located in Frere Hall. Later we shifted to the elegant building we constructed on Aiwan-i-Sadar Road. During the last 70 years, our Institute has tried to live up to the ideals with which it was established. It has provided intellectual shelter to generations of scholars from within the country and abroad, diplomats, media personnel, members of the business community, and above all, we have always kept our doors open for students. Through conferences, seminars and roundtable discussions addressed by eminent statesmen, scholars, jurists and experts in the field and through our publications, for seven decades we have contributed to the creation of informed public opinion on foreign policy and international affairs. Our unique library resources have been used by generations of scholars and citizens. Today, I would like to pay a tribute to the founders of the Institute who were some of the most eminent citizens of our country: Khwaja Sarwar Hasan, who brought the Institute from Delhi, established it and ran it; Professor ABA Haleem, who guided it with his wisdom and sagacity for many years; Shaista Ikramullah, Jahanara Shahnawaz, Dr. Mahmud Hussain, Dr. I.H. Qureshi, all members of the Constituent Assembly of Pakistan; Altaf Hussain, editor of Dawn newspaper; Jamshed Nusserwanjee, Yusuf Haroon, Mirza Mohammad Rafi and D.M. Malik from the business community; Hemandas Wadhwani, Shahid Suhrawardy, Mumtaz Hasan, M. Ayub, Mian Bashir Ahmad associated with the Sindh government and the young Agha Shahi and Rashid Ibrahim from the Civil Service of Pakistan. Our Institute has had its ups and downs, its vicissitudes and we have had to struggle to maintain our independent status. Therefore today we remember those who fought for its independence in the courts of law: Rasheed Razvi, Mazharul Jamil, Arif Hasan; the lawyers who worked without remuneration: Waheed Farooqui, Nuruddin Sarki, Kazim Hasan, Naraindas Motiani; Yahya Bakhtiar who helped to resolve issues – he was attorney general at that time; I.A. Rahman who supported us from the Pakistan Times. And Fatehyab Ali Khan whose courage and determination was the moving force behind this struggle. We have never looked back. Although the attainment of peace is driven by political forces, we believe that objective scholarship and candid dialogue can contribute to peace building. Hence in this jubilee year, we have organized this Conference to which we have invited scholars from South Asia and other countries so that we can discuss the dynamics and the positive and negative factors in pursuit of peace in our region. In conclusion, I would like to thank you again, Mr. President, for gracing this occasion with your presence. I welcome you again, Mr. President and all the members of the audience gathered here. This entry was posted in International Relations, Pakistan, PIIA, Politics, South Asia and tagged Civil Society, Democracy, Development, Economy, Pakistan. Bookmark the permalink.